The stamp issue features a set of six showing album covers, and a miniature sheet showing stage performances. 1st class - Hunky Dory, Aladdin Sane, and Heroes. There will also be a six-stamp retail book with the Aladdin Sane and Heroes 1st class stamps, and 4 x 1st class seep scarlet. More details will provided on our website soon. Nice to see this issue but, according to the RM list on 14th March there is a Music Giants II issue, they are really milking the music lovers . Music Giants I was Pink Floyd last year. Yes Ian but according to the list I was sent by TH there is an issue in June headed Music Giants II so what that is going to be they have not said yet. We will just have to be patient . And the first item is a downloadable pocket calendar in pdf format. No problem, Peter. The worst gaffes are made by copying what Royal Mail has written! 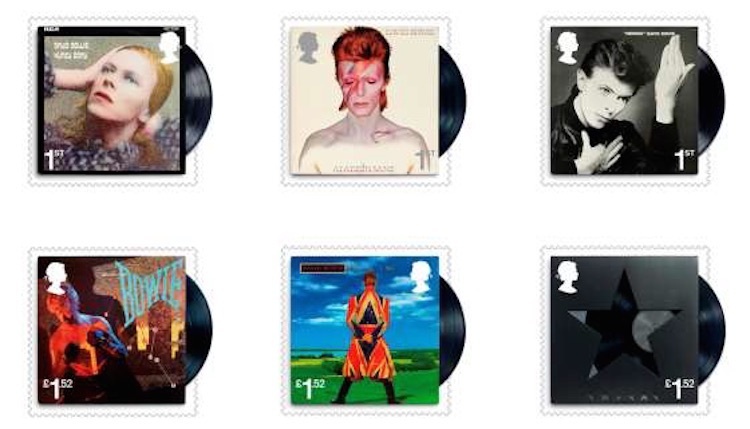 I think Royal Mail missed a trick by not including the 2010 Ziggy Stardust stamp in their Album Art Fan Sheet. Pity RM haven't put up the Windsor or £5 blue issue yet, and has anyone noticed that in all the issues so far that none contain second class values, rip off or not? 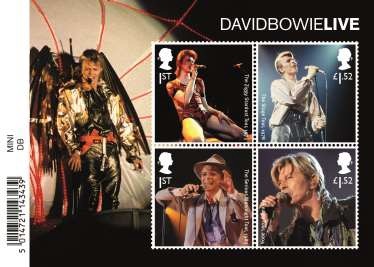 Looked last night to order the Machin, Windsor and Bowie stamps, but only the Bowie ones are showing. Royal Mail trying to cash in again on the fan base? Yes, in a word. The products aimed at stamp collectors are few, the set, the MS, Pres pack, FDCs stamp cards and booklet if you collect them. All the big money items are aimed at music fans. Bah humbug, first and "heavy" Europe rates. Looks like I'll only get first class and one or two of the miniature sheets. I just knew David Bowie was going to be used on the Music Giants stamp set, this is actually worth getting, I'm a big David Bowie fan, his music discography is one of the best, and such an iconic British musician. Thank you Royal Mail for doing this. I just checked with Royal Mail as I wanted to order a couple of additional items. None of the 4 "fan sheets" are including in my standing order which includes sheets and mini-sheets. Others might want a heads up. I'm not sure if this was the case for the previous Pink Floyd(?) sheet. Looks like I missed out on the David Bowie album art fan sheet limited edition. It's disappeared off Royal mail website and all sold out on ebay. And the ones that have sold on ebay may not be honoured either - since the sellers in question don't even know if they'll actually receive what they've pre-ordered. Pre-selling on ebay that far in advance is a highly dubious practice, in my opinion. WOPA have 40 of the album art fan sheet. How long they will last is anyone's guess. I see one of the other sheets (Aladdin Sane) has also now sold out on RM website.How can RM sell out on these things a month in advance of issue date? Just seems like massive market manipulation to me. Puts me right off collecting new issues any more. Remember that these are not aimed at stamp collectors, being premium-priced articles containing the same stamps that are in the collectors set. They are advertised as limited edition and advance orders are taken - they aren't going to be in post offices so online ordering is the only way to get them. Then think of concert tickets. Some sell out in minutes. When the announcement is made, if you want them you buy them then, sometimes a year in advance of the gig. If you are waiting to buy, then why? If you are not buying, then why beef? Any Bowie fan who misses out on the initial announcement has to buy on the secondary market, although unlike concert tickets, if you buy on the secondary market you are more likely to get what you pay for. Hi Ian - yes that does give some perspective. Interestingly I noticed the Album Art fansheet was back on sale on the RM website yesterday morning (21/2) - but gone again this morning. Aladdin Sane comes and goes! I am guessing RM will hold some for sale on the release date but who knows.....This is proving a very interesting issue - I don't think there's ever been something that's sold out so far in advance? The collector stamps will always be available - though some may sell out soon after issue. Special editions - which are directed at fans rather than stamp collectors - are always placed on sale early, as soon as the stamps are announced to the colelctors AND fans ("grab 'em while they are interested") so it will probably increasingly be the case that popular editions sell out early. Hi Ian. If it might help Norvic blog readers - the Bowie Album Art fan sheets are on sale on the RM website again this morning (6 March) - but won't last I am sure.